In a meeting recently, I queried a program manager(PM) about the plan to get something done in a month. The PM indicated he couldn’t answer as his event horizon was at best a week from now. We both laughed as it was excellent nerdy humor within a company that builds spacecraft systems and components that travel throughout the solar system and help observe celestial phenomena like black holes. Even after relishing in our nerd-ness, the idea stuck with me. 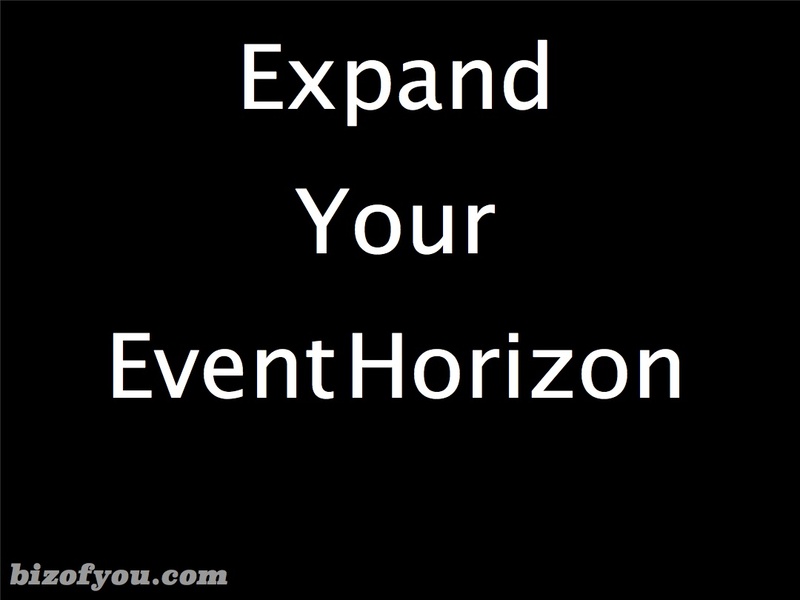 From the business of you perspective, what is your event horizon? How far can you see into the future with any certainty? Assuming everything goes close to plan, do you know what will happen tomorrow, next week, month or year? The further we get away from today, the less we know about what may happen to us. We may plan to be out of college in four years, but may wind up taking five or six. We may plan to complete a project at home in an afternoon, but may take a week or two because we don’t have the tools or other resources to get it done. We may plan to retire in three years and wind up retiring early for some unknown reason (like getting fed up with working). Uncertainty is an inescapable part of our lives no matter what we believe. Having any sort of plan allows us to approach a given situation with a little more certainty and confidence. We can also measure our performance in order to better ourselves if we have to repeat a particular activity. No doubt uncertainty causes us to adjust our plans as we go but without a plan to begin with, we can only be so effective or efficient. As Dwight D. Eisenhower said, “Plans are nothing; Planning is everything.” For the business of you, having a plan and most importantly a vision of our future allows us to adapt to the uncertainty inherent in every moment. It allows us to seize the opportunities that arise. Having a plan extends our event horizon further into the future and lends an air of certainty to our actions here and now. That little amount of certainty in our actions can give us the competitive edge needed to achieve our objectives. Planning is critical to look further into the future at what you want to become. That’s an awesome quote. Thank Joe.